5Pin Media proudly presents their 20th MIDI FOCUS SERIES release AGGRESSIVE DRUM & BASS BEATS produced by uber beatsmith Dan Larsson. 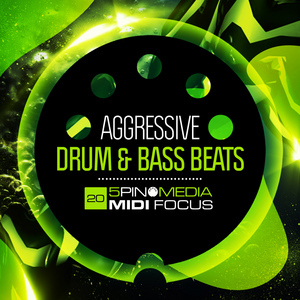 This collection covers the more energetic style of Drum & Bass Beats made popular by the likes of Noisia, Black Sun Empire, Blockhe4d and Pendulum to name a few. When it comes to no-nonsense slamming breaks and beats Producer Dan Larsson is the Don! Designed for both producers and DJs alike the sounds and MIDI are arranged across 13 drum kits with 10 patterns per kit, all clearly labelled for quick and easy access.Each kit is ready for laying down as either a full production backing track or to use as a mix tool when DJing. Ableton Live 8 and above users are presented with a Live Project containing 13 drum racks and 130 labelled MIDI files ready for your productions or live DJ sets. 19 WAV loops, 4 WAV Stems and 8 MIDI files all labelled to the corresponding song part.